Late September and Omi-Takashima is full of colour. A blue, early autumn sky over green-gold, soon-to-be harvested rice, itself framed by clumps of red spider-lilies. 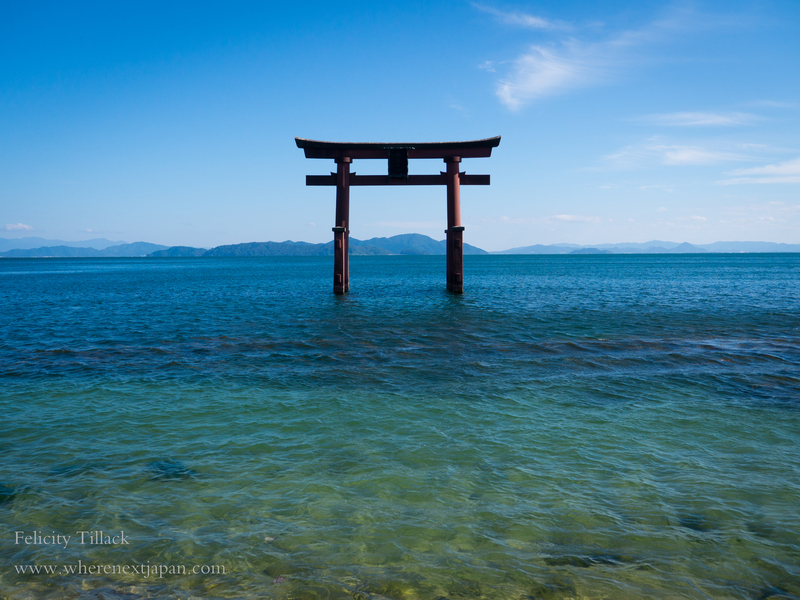 The small town along the west coast of Lake Biwa is occasionally visited by Osaka-ites for the gorgeous, clear-water beaches. Up in the hills nearby, in a hamlet called Hata, this is the season for city-farmers to come visit and learn how to crop the fields they rent. Hiromi Kawaguchi, part owner of Tour du Lac, met four visitors, two Australian friends and an older French couple, at the station, and introduced us to our tour guide for the day: a lovely, quietly spoken woman called Shino. We were to join the rice-harvesting festival. 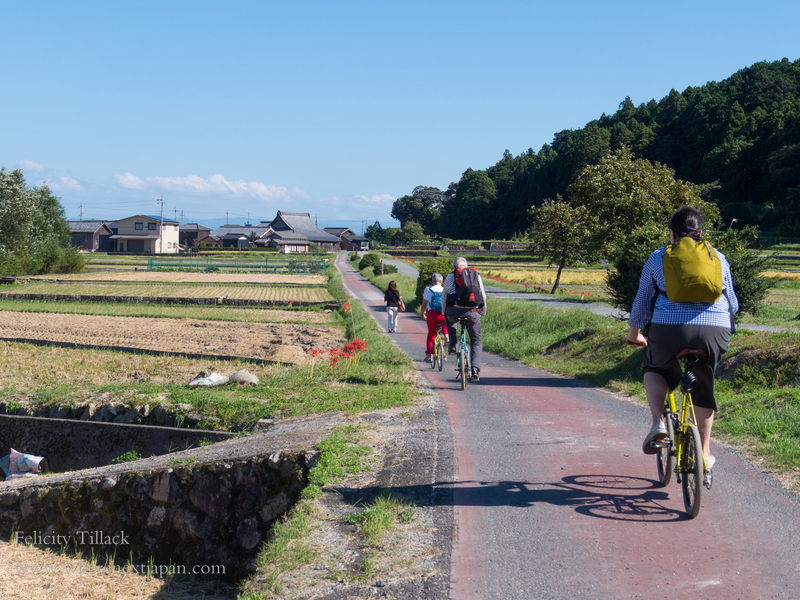 As we wound up through the rice fields, we passed the cars of the other, barely even weekend, farmers, their numbers plates from southern Osakan bed-towns, Naniwa or Sakai, while others came from Kobe. All come to reconnect with a part of Japan they rarely see. 45% of Japan’s population live in the the three Kansai giants: Osaka, Kobe and Kyoto. The dense megapolises are where the jobs are, where the oshare (trendy) restaurants are, where the concerts play. Out here there is only rice, and mountains and trees, giant cockroaches, and a few frogs. The countryside is emptying, aging, and in some places, is already left to the forest to reclaim. 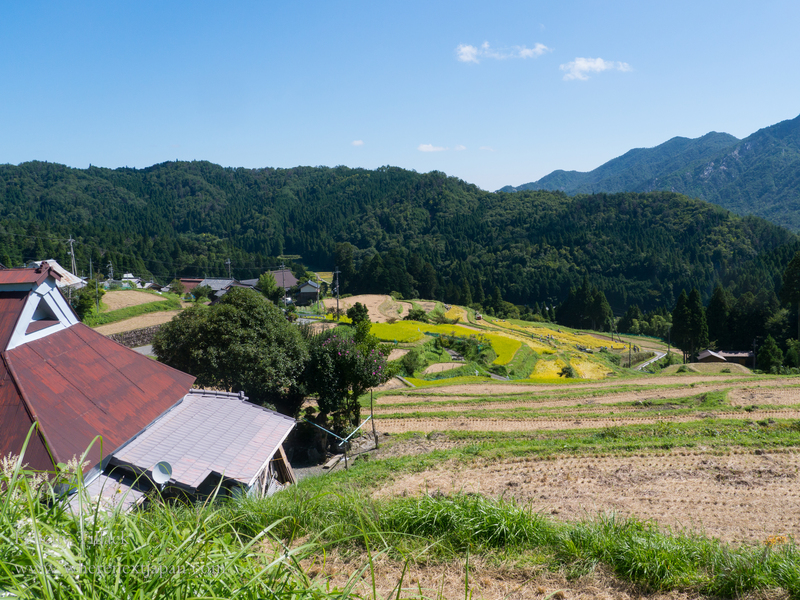 Rural Japan has become difficult for even Japanese to access. My Australian friend and I have lived in Japan for a long time, and know Shiga well. Our French companions however, had spent half a week in Tokyo, and another in Kyoto, and were keen to see something different. View from the top field in Hata. Difficult enough to translate the train lines in Osaka, leaving the cities means knowing where to go, and what to do there; how to communicate when the English signage ends, and in the end, feeling mighty conspicuous. 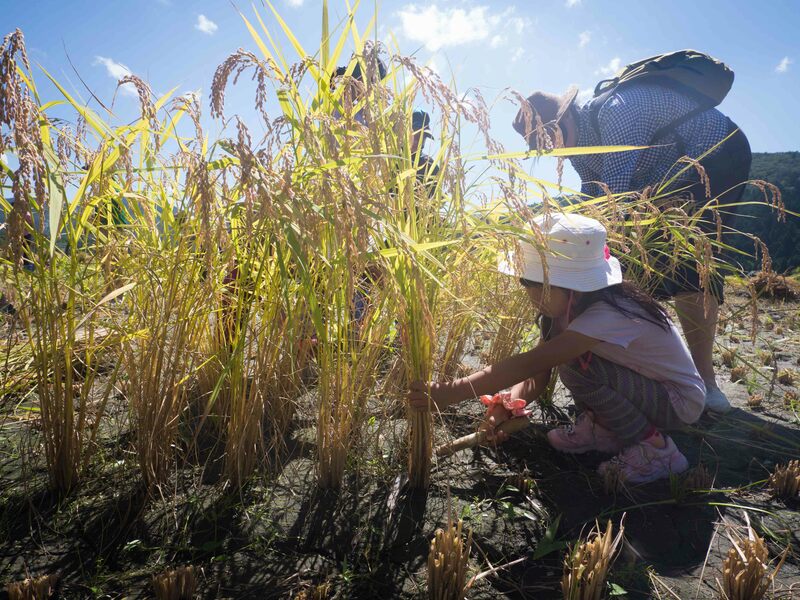 Tour du Lac, a small, locally owned company in Shiga, is trying to remove these obstacles in order to bring foreigners and a tiny, farming community together. 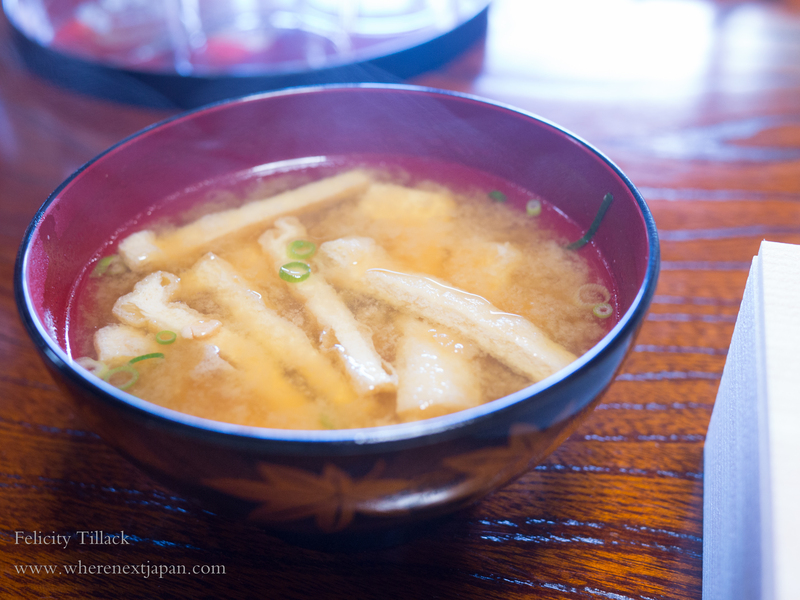 Offering everything from Cooking With a Japanese Grandma to Kayaking At Sunrise. We were trying the Tranquil Lakeshore Ride with Home Visit. We reached the farm-house, where an elderly couple, and their middle aged children welcomed us heartily, and took our bags. Hiromi’s kindergarten aged daughter raced ahead of us as we climbed to the top paddock to enjoy the view, before meandering down to join the rice-harvesting. Showing us how it’s done. Dodging photographers, we took turns at slicing the dry stalks and stacking them along the edge of the terraced field. Around and above us, harvesting machines did the job far more efficiently, but without the fun of local school children trying out their English, or showing off the frogs they’d found in the mud. 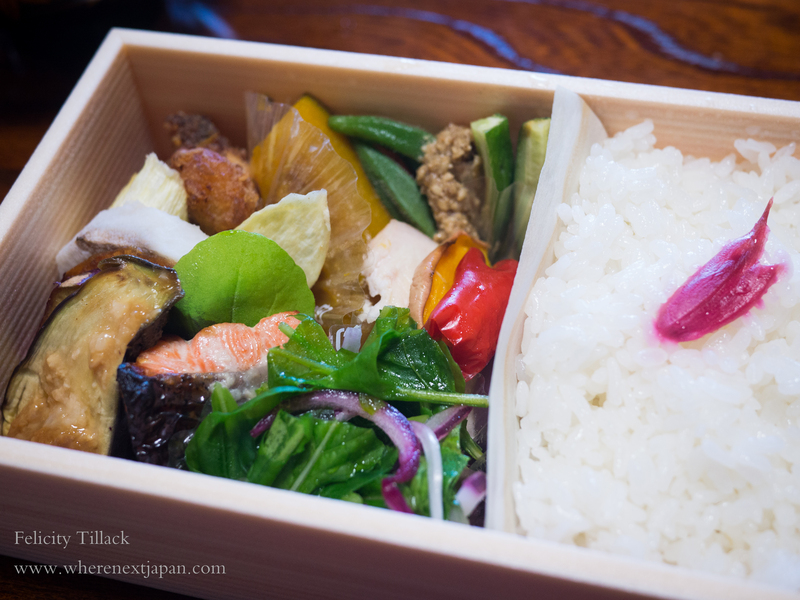 Back at the farm-house, we took over the kitchen and brewed up miso together, using Shino-san’s home made miso paste, and served it with our bento lunch of local ingredients, and freshly made mochi. 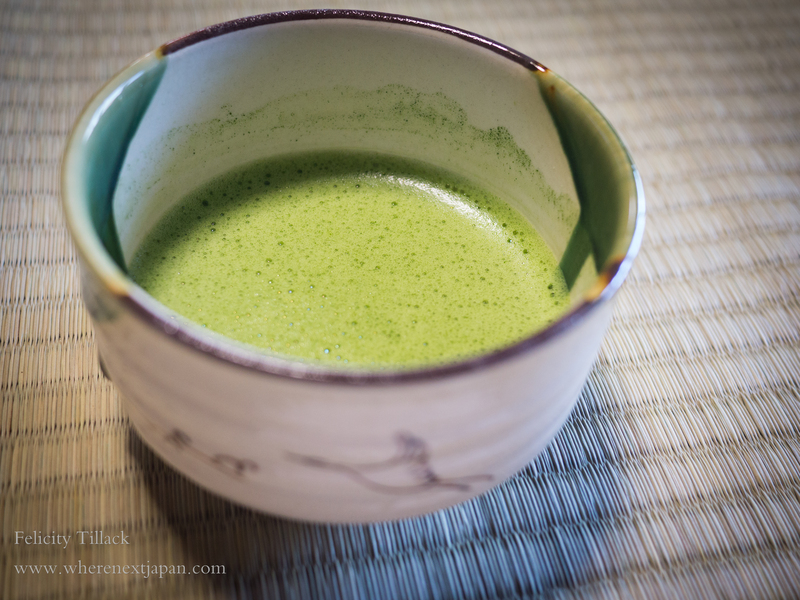 Emi, the other half of Tour du Lac, gave an introduction to tea ceremony. All with a background through sliding doors of calm fields, and distant, blue mountains. 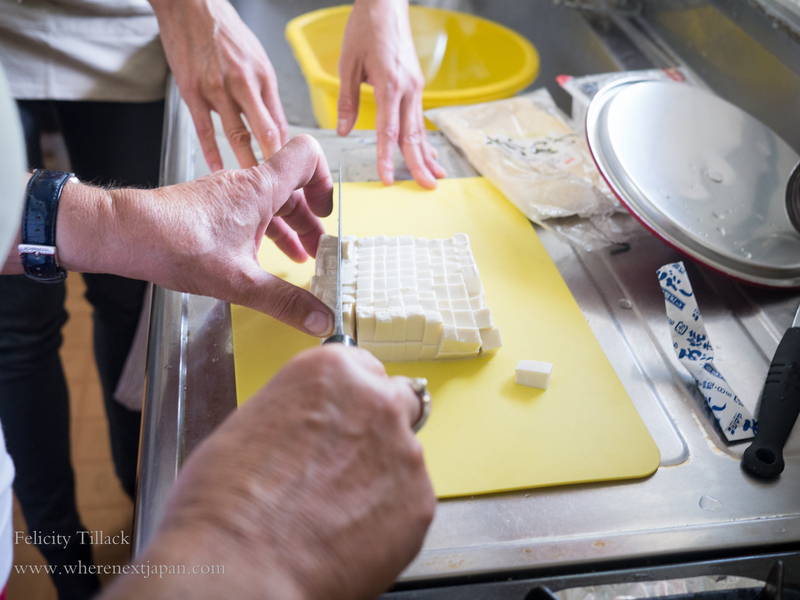 Slicing tofu together in the farm-house. All the ingredients were seasonal, and locally sourced, with a little ingredients card describing each one. 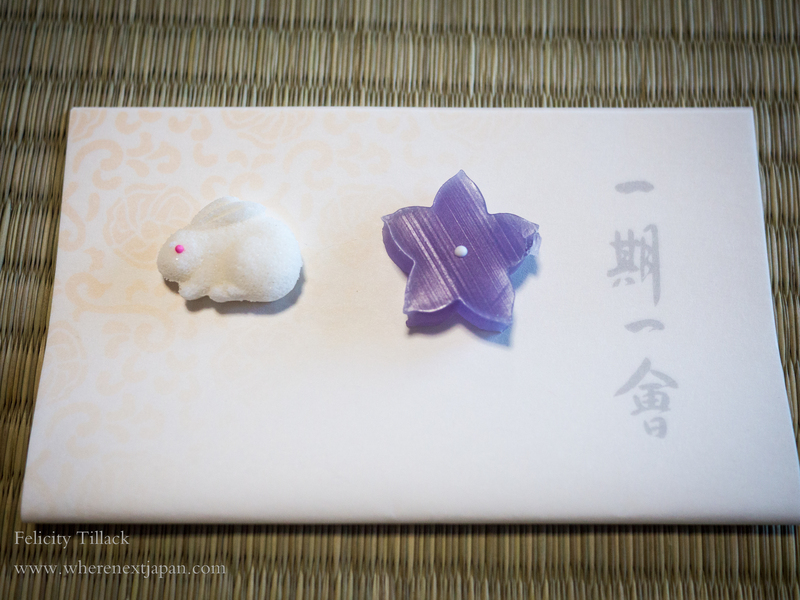 Tea ceremony wagashi (sugar sweets) reflect the season. 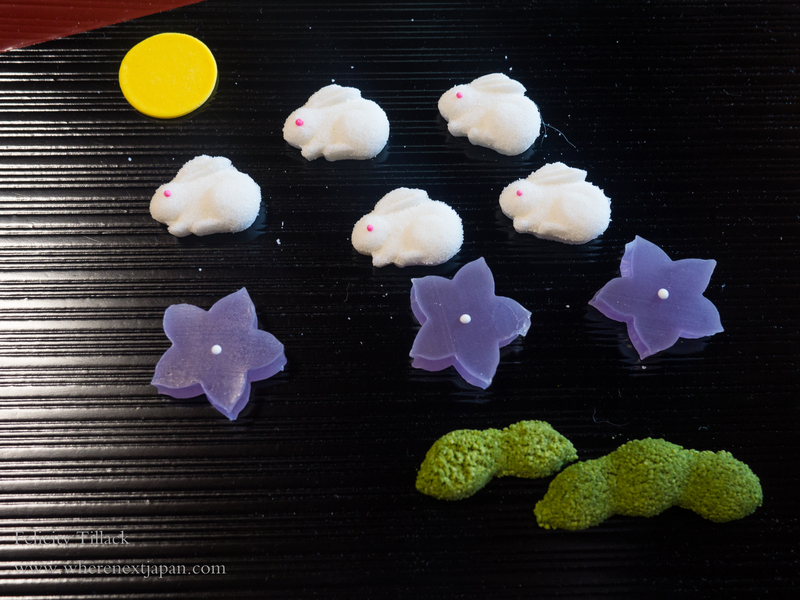 For us, in autumn, the harvest moon, the rabbit who can be seen diligently making mochi in the moon, the Japanese bellflower, and edamame. Our tour though, was not all about relaxation. In fact, while serenely wandering down through the village towards the bus-stop, we realised we were almost out of time, and some jogging was involved. Unlike Osaka’s subway, buses don’t come frequently in Hata. Back at the station, we were given bikes, and taken through country roads to Shirahige shrine, whose floating gate is sometimes mistaken for one much more famous. Shino led us up through the slopes of Shirahige, explaining all the small shrines, and how to pray to their gods properly. Little traffic on the back roads. 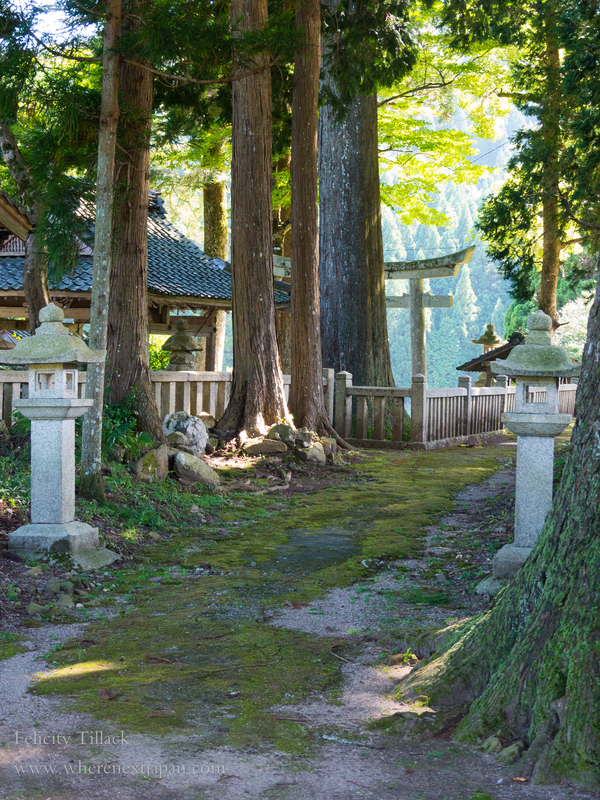 The calm of the scene belies the busyness of the road running alongside Shirahige shrine. We shared snacks, stories and mail addresses while waiting for the train. The day had passed quickly, despite the relaxed pace. 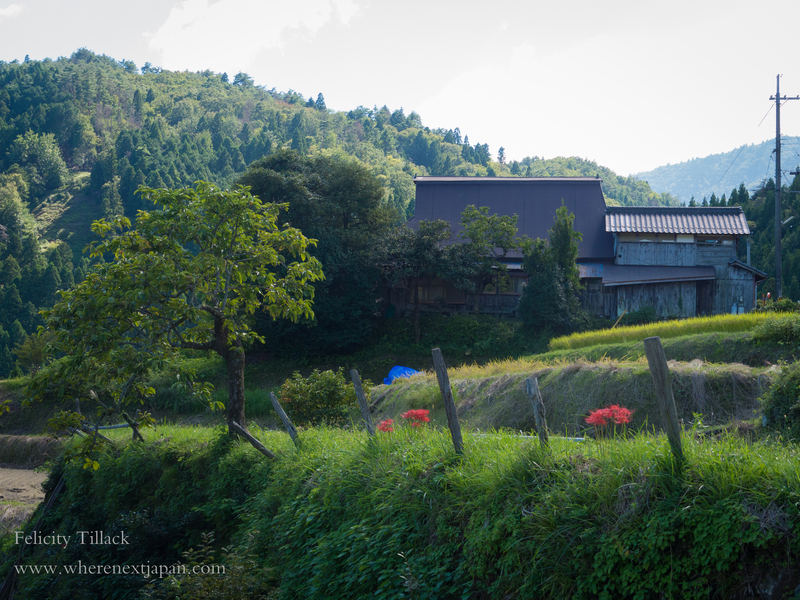 As we travelled back to Kyoto, the landscape changed, slowly but surely, less mountains, less fields, more houses, more roads. The city is fun and convenient, but it’s nice to know that escape is close at hand. Started in 2014, and still in the process of perfecting their model, the owners and guides of Tour du Lac are warm-hearted hosts, and open to suggestions on how to improve their practice. With the popularity of experiential travel on the rise, and in the run up to the 2020 Tokyo Olympics, there is a strong chance Tour du Lac will be successful as part of a niche travel sector providing slow-pace, slice of life tours to foreign visitors.